The Battle of Saratoga is considered the turning point of the American Revolution. The battle was fought in late 1777. I. It was actually two engagements: the Battle of Freeman's Farm (September 19) and the Battle of Bemis Heights (October 7). The Americans were led by General Horatio Gates. The British were led by General John Burgoyne. On October 17 Burgoyne surrendered his army of nearly 6,000 British soldiers. The American victory helped convince France to come to the aid the Continental Army. It also helped them recognize the United States. In early 1777, General William Howe asked London to approve his plan to attack Philadelphia. This would destroy the rebel American government. 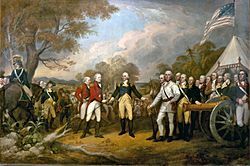 In Canada, General John Burgoyne submitted a plan to move down through New York and meet General Howe at Albany. This would divide the colonies. London approved both plans. Burgoyne began moving down the Hudson River valley from Canada. He split his force into two columns. One, under Colonel Barry St. Leger moved east from Lake Ontario down the Mohawk Valley. They attacked the Americans at Fort Stanwix. The Americans sent two parties to relieve the fort. The second, under the command of Benedict Arnold, drove the British away from the fort. St. Leger's column retreated back to Lake Ontario. Burgoyne continued south with his own column of about 7,000 British and Hessian soldiers. He was joined by about 500 native Americans, allied to the British. Burgoyne made a proclamation to his Indians to go out and strike at the enemy. He added that women and children, or any who did not oppose them should not be killed. But men, women and children were killed. One famous incident upset all the colonists. A young woman named Jane McCrea was engaged to marry one of Burgoyne's young tory officers. Indians bringing her to Burgoyne fought over her, killed and scalped her. Burgoyne wouldn't punish the Indian who killed her. This proved he could not even protect friendly colonists. Newspapers in the colonies spread the story. As a result, a great many Americans who had been neutral took up arms against the British. The story even reached England. In the House of Commons Edmund Burke spoke out against the British policy of using Native American allies. Howe had captured Philadelphia. But it took so long he did not send any forces north to support Burgoyne. 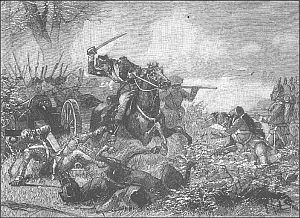 On September 19 Burgoyne attacked the Americans who were entrenched on Bemis Heights near Saratoga. He again fought Americans at Freeman's Farm. This time it was American riflemen under the command of Daniel Morgan. American Marksman killed a large number of British and Hessian officers. This was intended to cause confusion among the British forces. Burgoyne lost about 600 casualties. He claimed victory although he was still held in place by the Americans. Burgoyne tried to attack the Americans again on October 7. But the Americans held out against him. A counterattack led by Benedict Arnold pushed the British back further until they finally retreated back to Saratoga. This battle cost Burgoyne another 600 casualties. The American losses were less than 150. Burgoyne's army was now surrounded by a much larger and growing American army. On October 13, 1777 Burgoyne asked for a Ceasefire. Horatio Gates, the American commander asked for Burgoyne's surrender. But Burgoyne stalled and did not give an answer. The terms given by Gates were harsh. Finally Gates offered better terms. On October 17, Burgoyne surrendered. Burgoyne surrendered his whole army of 5,752. He gave up 42 cannons, 7,000 muskets and all his supplies. Officers were separated from their men and placed on parole. Unlike their men they were allowed to keep their pistols. Gates invited Burgoyne to dine with him. The two men were friendly. Each toasted the other's leader. The British and Hessian soldiers were marched to Boston. Per the agreement they were to return to England on their promise not to fight again. While some did return to England, Congress changed the terms. Many were sent to prisons in the colonies to wait out the war. Battle of Saratoga Facts for Kids. Kiddle Encyclopedia.